Your web browser stores a huge amount of personal information about you, including the web sites you have visited. In many homes where computers are shared between several people, this could represent a security risk. While it is easy enough to use browser options to manually clean out these records, Click&Clean is a Chrome extension that can be used to automate the process. In just a few clicks, the addin enables you to wipe your browsing history, clear the list of downloaded files and much more. This is obviously useful for preserving your privacy, but Click&Clean can also delete cookies and clear out cache files. In addition to this, Click&Clean can be used in conjunction with third-party tools such as CCleaner and Disk Cleaner to wipe your histories and records in Windows. 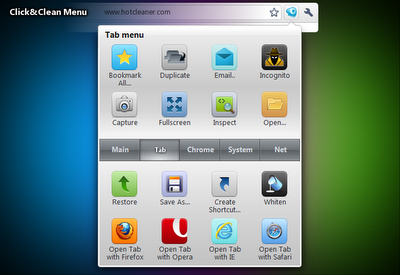 There are also a number of handy options such as a keyboard shortcut to close all open tabs. Click&Clean does little that can't already be achieved using the built in options in Chrome, but it does help to automate the process and enables you to clear a number of logs in one fell swoop. As it is free of charge, it is worth installing, as it helps to simply the process of maintaining your privacy. A handy little add-on that doesn’t add many new options, but does make it easier to clear Chrome's log files and browsing history.